Easter Sunday: The greatest Sunday in the history of mankind where all can gather to celebrate the victory over the grave, the triumph over defeat and the supremacy over death! Join us Sunday April 21st, 2019 at 10:30am as we celebrate the resurrection of our Lord and Savior Jesus Christ! This special day we will be teaming up with Convoy of Hope with the “One Day To Feed” initiative as 100% of the entire offering that comes this day will go to the Convoy of Hope world wide feeding program. Click HERE for more information. All Worship Leaders and Worship Teams are welcome to attend this FREE worship workshop with Lydia Marrow from Shake the Nations. This Worship Workshop will focus on: In-Depth teaching on the Hebrew word and roots of worship, songwriting and song choices and difference between horizontal and vertical worship. There will be time for Q & A and of course worship. If you and/or your team plan on attending this FREE Worship Workshop, please fill out and submit the form located below Lydia’s bio. Lydia Stanley Marrow has an unwavering passion for the things of God and is desperate to see the true power of the Gospel return to the Body of Jesus Christ in these last days. Lydia demonstrated the call to ministry through her giftings of both leading worship and preaching with a prophetic edge from a very young age. She was touched in the Brownsville Revival in 1996, where she received her call to the ministry when she was twelve years old. She served in her grandfather’s church with her family for several years. She then went on to study worship ministry at the Brownsville Revival School of Ministry, graduating in May of 2004. After a brief period back in Augusta serving her parents’ church as a worship leader, she then served as the worship leader at Church of His Presence for seven and a half years alongside Pastor John Kilpatrick. During that time, the powerful Bay Revival broke out in July 2010 with Evangelist Nathan Morris. For three years, she experienced firsthand the outpouring of the Holy Spirit through powerful miracles, signs and wonders. Lydia Marrow joined STN in February 2014 and serves as a worship leader. Lydia has led worship for countless services with Evangelist Nathan, and she has a heart for revival and for the Gospel. Lydia also serves as a speaker for STN, with a unique perspective on the partnership of worship and the Gospel. She is also the writer/editor for all STN written and printed material which includes our quarterly newsletter, website and products. Lydia and Nathan Marrow and their son, Malachi, reside in Central Florida serving Shake the Nations Ministries, preaching and leading worship across the United States and around the world. Lydia’s passion is to see lives changed by the truth of God’s word and the reality of His presence. Thank you! We look forward to an amazing time together! Join with us as we celebrate & encourage this years graduating seniors. If you have a child graduating and would like them to be recognized please view the 2019 Grad Letter below, and then fill out and submit the form below. All applications/pictures will need to be submitted online or to the office or CLIK staff by April 28th, 2019. Where will Open House be held? Would you like your open house printed on the church-wide open house list? Thank you! If any further information is needed an office staff will contact you shortly. Join us for an informational meeting in the chapel following the morning service regarding an upcoming trip to Israel planned for November of 2020. With limited seating available, you don’t want to miss this very special first Daddy-Daughter Date-Night. Join with us for this formal evening where we as fathers, get to treat our daughters to a night of quality food, fun and time! Each ticket purchase includes: $10 donation to Tipton Ministries, elegant dinner buffet, formal 5 x 7 pictures, fun & games for all ages, gift bags for all daughters and multiple chances to win prizes throughout the night and a very special "Daddy/Daughter Dance"
This date night is open to fathers & daughters of all ages! Get your tickets below! We are celebrating with those who are publicly professing their faith in Jesus, as Lord and Savior. This outward symbol of being water baptized is evidence of an inward change - a change of heart. If you desire to be water baptized, simply fill out the form below and come to the baptism class prior to service on Sunday Feb. 24th at 9:15 am in classroom S3. You don't want miss out on this powerful evening with guest speaker Chad Varga as he shares his incredible testimony. From the streets of Detroit in a broken home, to collegiate and professional basketball and finally landing as a pastor & motivational speaker. On Wednesday March 6th at 6:30 pm, we will be joining together in the Sanctuary to support our CLIK Youth Students as they perform their various Fine Arts competition entries. Cake & cookie reception to follow in the west lobby. Christmas Eve with a modern twist. Come and hear the Christmas story in a way you’ve never heard with the “Inn a Holy Moment” special service. Following the production, a traditional candle light service will commence at conclusion. The annual Ladies Christmas Tea is soon approaching! If you have never attended the Ladies Christmas Tea the evening will be a time to connect with friends, and give you the opportunity to make some new ones. In a season where the busyness of life can sometimes over take you, our hope is this night will leave you refreshed and focused on the true meaning of the season. The 2018 Ladies Tea speaker, is Trinity’s very own Pastora Betsy King. As a credentialed minister with the Assemblies of God, Pastora Betsy desires to see every women, in and outside of Trinity to find their place within the Kingdom of God. Her heart longs for women of all ages to feel accepted, welcomed and empowered within the body of Christ! Calling all ladies! On Tuesday November 13th from 6:30pm to 8:30pm come support missions by attending the Ladies Pallet Party. Cost is $15 per board ($10.00 of each board goes towards mission trip.) Everything is provided, including snacks. *located in Fireside Room 1 - enter by the gymnasium entrance on the southwest side of the building. You are invited to join us for the annual Speed the Light (STL) Pie Auction, which will be held on Sunday, November 4th, 2018. For the first time, the auction is a formal event. This evening aims to raise money for STL, the Assemblies of God youth missions program that provides transportation to missionaries all over the world. Recently, STL committed to provide new ground transportation for Convoy of Hope, a national disaster relief missions organization that provides aid for people who find themselves in turmoil after a natural disaster. Your $10 ticket includes a plated dinner and your choice of pie. Doors open at 5:00 pm, and the silent auction will be open for bids upon arrival. Please feel free to put on your best and be prepared to bless! Thank you in advance for partnering with STL and Convoy of Hope. Join Jimmy and Karen Evans for a marriage conference unlike any other, as couples of all ages will gather to revive and restore the dream of marriage. We will be staying at "The Shack" resort in White Cloud, Michigan. Rooms are limited so register and pay today! All Rooms with an asterisk (*) noted are rooms with 2 beds in the room, please click on room to see all amenities. Students between 6th and 12th grade are invited to attend this 4 week competition where students come to compete in high energy team competitions. Students are encouraged to bring guest between 6th and 12th grade. Each guest brought results in added team points and added talent for their team. Each week a speaker will encourage the students and share the gospel message. 2018 momentum will commence on the following Sunday nights. September 16th, September 23rd, September 30th and October 6th from 5pm- 8pm. Registration opens at 5pm and competition begins at 6pm. Students must register to be eligible for any prizes and giveaways and team points. It's that time again for our annual church picnic with an emphasis on community! We want you to come out and enjoy a fun filled day with FREE food, yard games, inflatables and more! Bring your lawn chair and hang out! Make a point to meet people you may have not yet, make new friends and expand your Trinity Community! PLEASE sign up in the black books on Sunday mornings in the pew, let us know how many in your family will be attending so we can plan accordingly. Also... all kids 6th grade and under... bring your swimwear (modesty counts!) and plan on having fun on an inflatable water slide as well as a water balloon war inflatable. All students going into 6th grade through those whom recently left 9th grade are invited to the end of summer annual Bonzai party! Inflatables, pizza, snacks, games and live music. Our goal is to assist families in the Mount Morris School District with school supplies & encourage families to have fun together. This is a 5k (3.1 mile) or 1 Mile run/walk. Please dress in modest attire for this family friendly event. *T-Shirt only guaranteed to all Early Registrants Before July 18th, 2018. Be Ready for the Color Splashing along the 3.1 mile course. Baby strollers, runners, walkers, crawlers, hoppers, etc. welcome! All that are seeking a camp scholarship must contact the office at (810) 687-2800 by Monday, June 11th, 2018. No request will be taken after June 11th, 2018. For all youth going into grades 7 through 2018 graduating class. 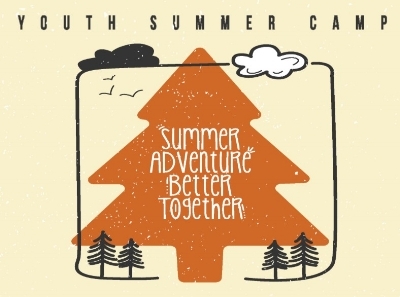 Deadline for camp registration early bird price of $199 is July 2nd, anything after then will cost $234. Click below to register and pay online! *Please note date of youth camp is July 16th-July 20th. For all kids going into grades 3 through 6. Deadline for camp registration early bird price of $225 is July 2nd, anything after then will cost $260. Click below to register and pay online! *Please note date of kids camp is July 16th-July 20th. Calling all junior high merge students... come and enjoy a time of fun playing a real life game of "Where's Waldo". For this event kids will be teamed up and given a photo of "mystery people" that they need to find amongst the crowds at Frankenmuth River Place. Deadline to sign up and pay is Wednesday June 27th. Please sign up and pay below or see Ronnie by the youth CLIK room in the West Lobby. All tickets purchases will receive the "Tortured for Christ" book for FREE! All proceeds go to The Voice of the Martyrs. The Voice of the Martyrs presents the inspiring new movie Tortured for Christ, a cinematic retelling of the testimony of VOM founder Pastor Richard Wurmbrand as written in his international bestseller Tortured for Christ. This movie was produced to honor the 50th anniversary of the book’s 1967 release. All kids invited to the annual easter egg hunt on Saturday March 24th at 10:00am. You do not have to be an attender or member of Trinity to come, everyone is welcome to the fun events for kids from 6th grade and under. Available to help with making this a successful event, please sign up below!